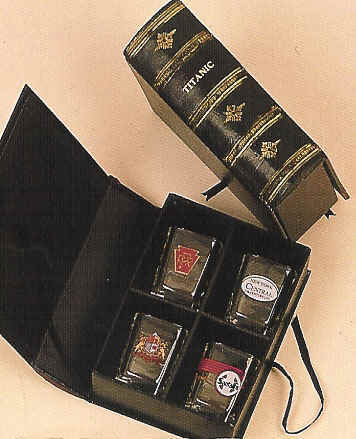 Many men love a fine Cuban Cigar ....we have some very special gifts for them for their library ! Each exquisite humidor is born from a heritage that spans more than a century of quality woodworking craftsmanship. Only the highest quality lumber is used, kiln dried to 6% moisture content to prevent warping or cracking. It takes more than 65 individual operations to create these masterpieces. 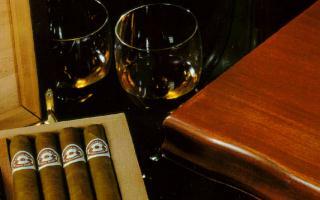 The Reed & Barton line of Humidors was developed by Cuban Cigar aficionados, to assure the freshness of each Cuban Cigar with in. 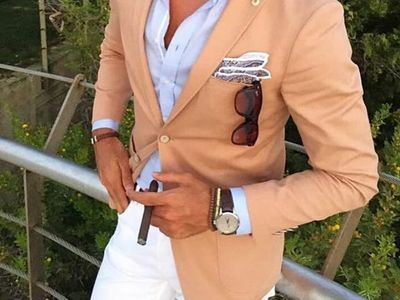 The lining of each chest is constructed of Spanish cedar, which gives the humidor a distinctive aromatic character, sure to enhance the flavor bouquet of any Cuban Cigar . 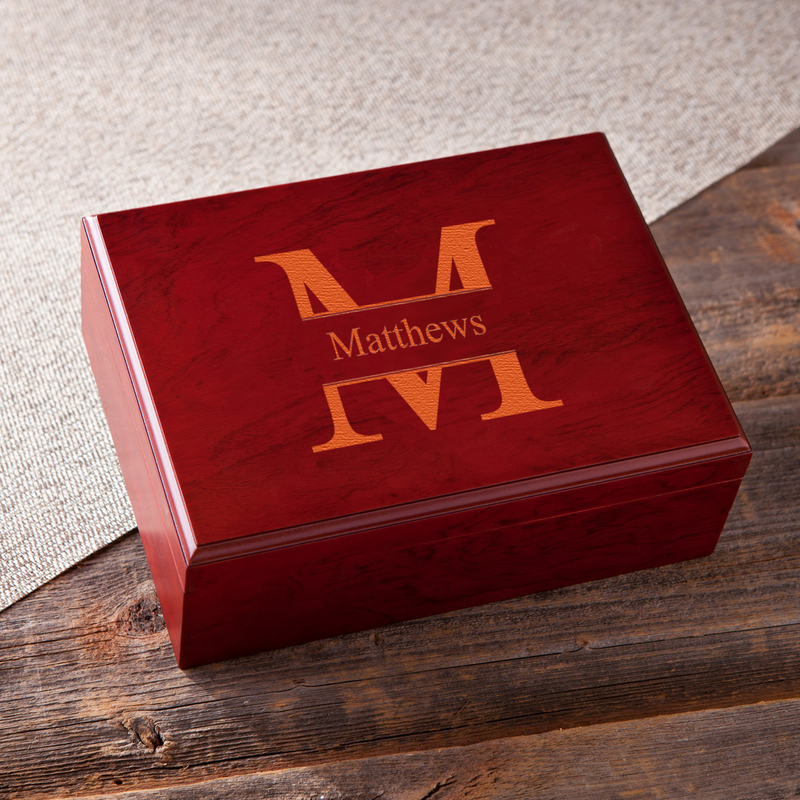 Each Reed & Barton Humidor in handcrafted to ensure optimum conditions for generations of smoking pleasure. 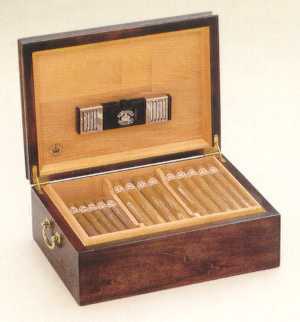 Solid brass handles, hinges, and locks in crafting their humidors. 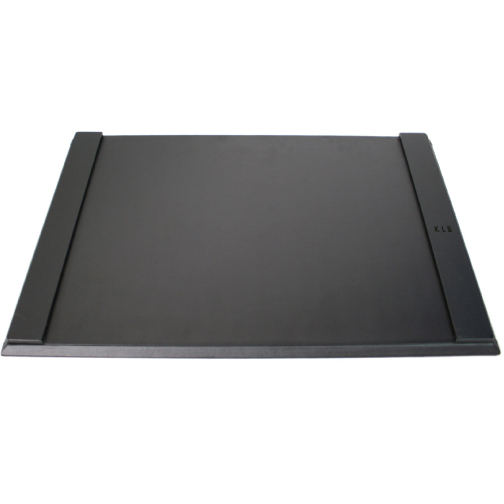 In addition, the joints are mitered and notched, which solidly locks them together to make a sturdy corner that will not come apart. 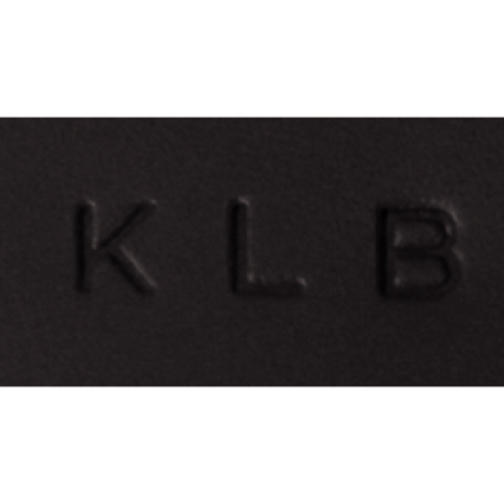 Brand new Limited Edition Brace ! 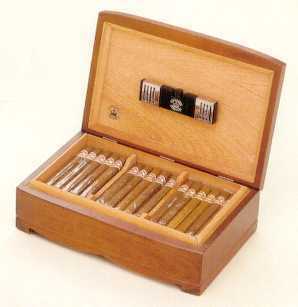 9 1/4" X 7 1/4" X 3 3/4"
Holds approx one dozen 'standard' sized cigars. 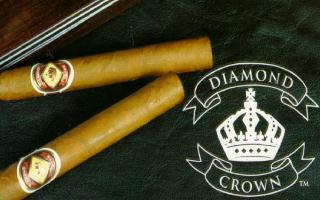 Varies with cigar length, width, etc. 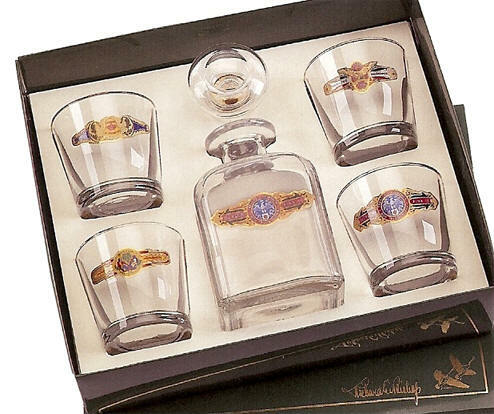 10 5/16" x 8 3/4" x 4 5/16"
Library Cocktail Glass Sets in our Small Library Storage Box! Unbelievably wonderful gifts shipped in this fabulous gift box...which then can be also used to store other things..................two gifts in one ! 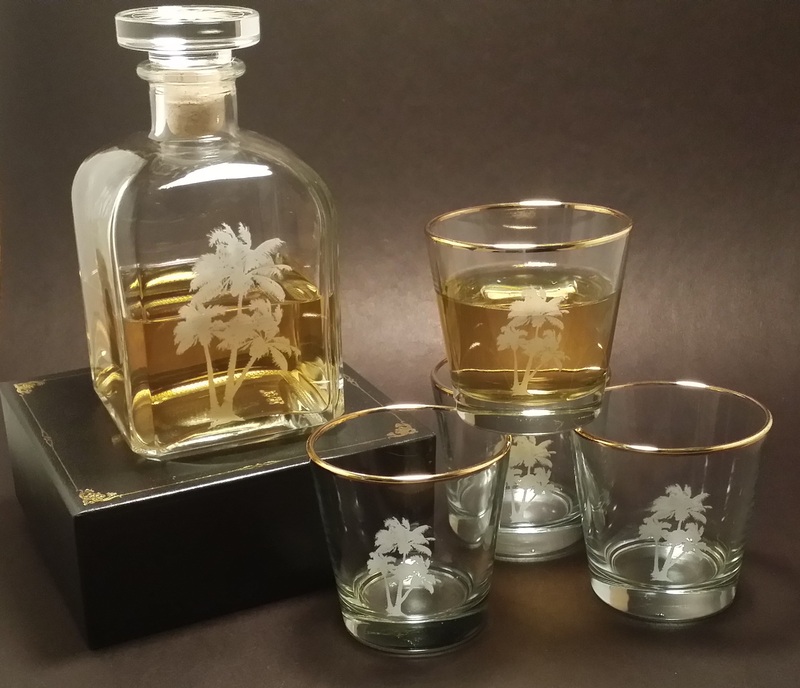 Sets of 4 glasses as shown, with 4 different glasses, 2 1/4 oz size....for those who like it "neat". Even a choice of book covers colors! 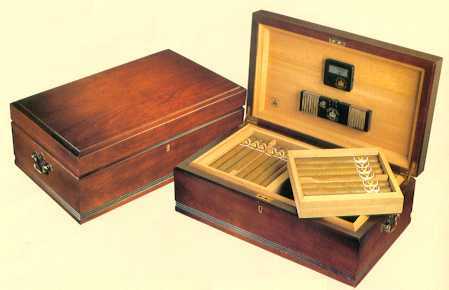 Our most luxurious Humidor ! Lined with Spanish Cedar, this cabinet features a rich Mahogany finish, two adjustable Spanish Cedar dividers, polished brass quadrant hinges, and two fitted, Spanish Cedar lift-out trays with one divider each. 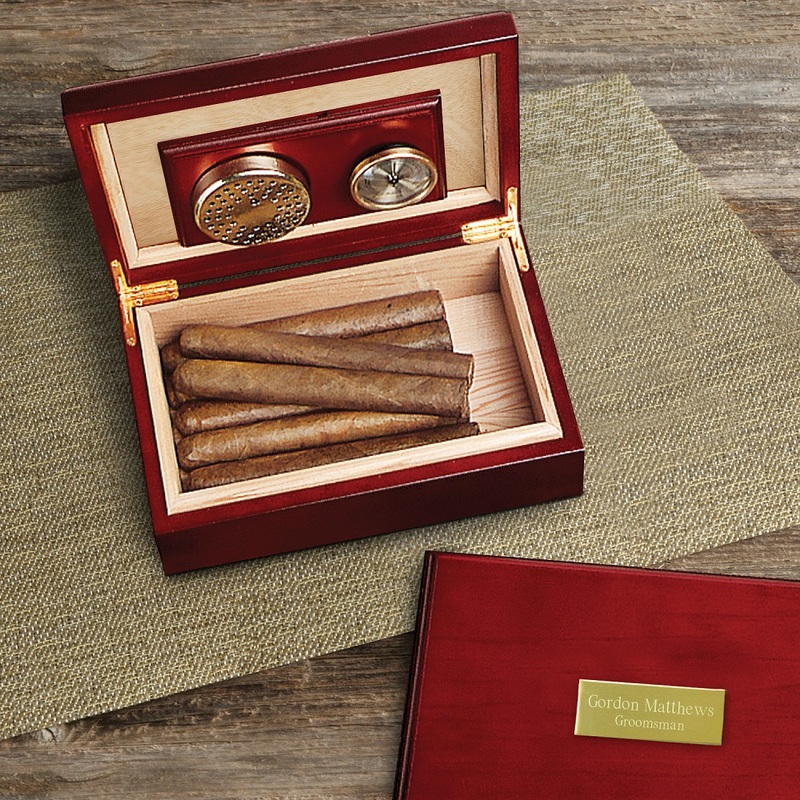 Antique brass handles and custom lock and key complement this elegant, spacious humidor. Includes the Diamond Crown humidification system and digital hygrometer. 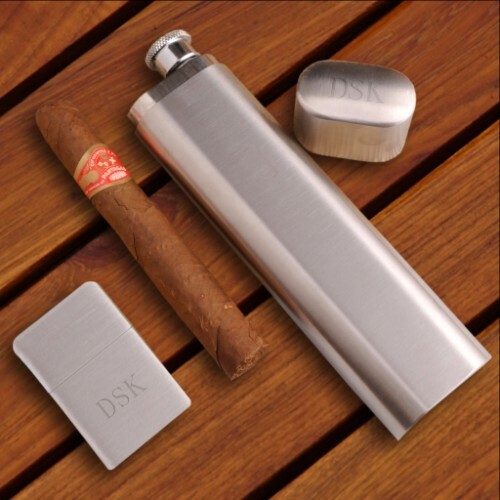 Holds 110 large Cuban Cigar s, 8-1/2" x 52 gauge. Interior Dimensions : 15-3/4" x 8-1/4" x 4-5/8"
Exterior Dimensions : 18" x 10-3/8" x 6-1/2"
This deluxe and spacious Mahogany finished chest is lined with Spanish Cedar and includes polished brass quadrant hinges, antique brass finished handles, two adjustable Spanish Cedar dividers, the Diamond Crown humidification system, and a digital hygrometer. 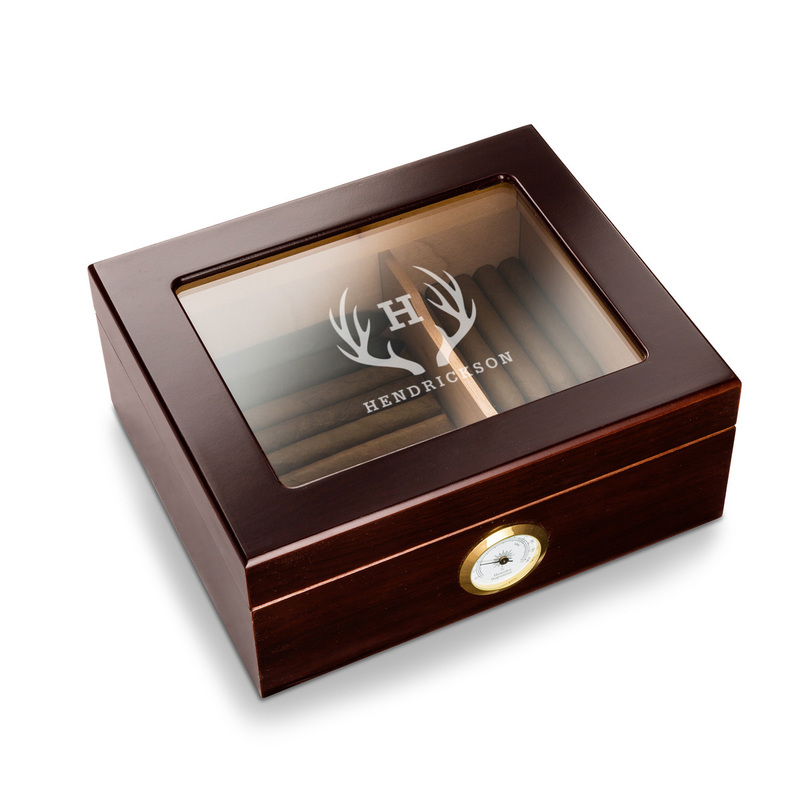 Holds 75 large 8-1/2" x 52 gauge Cuban Cigar s.
Interior Dimensions : 12-1/2" x 8-5/8" x 4"
Exterior Dimensions : 14-3/4" x 10-5/8" x 5-5/8"
An exquisite, contemporary stylish humidor with a beautiful Cherry finish and lined with Spanish Cedar. 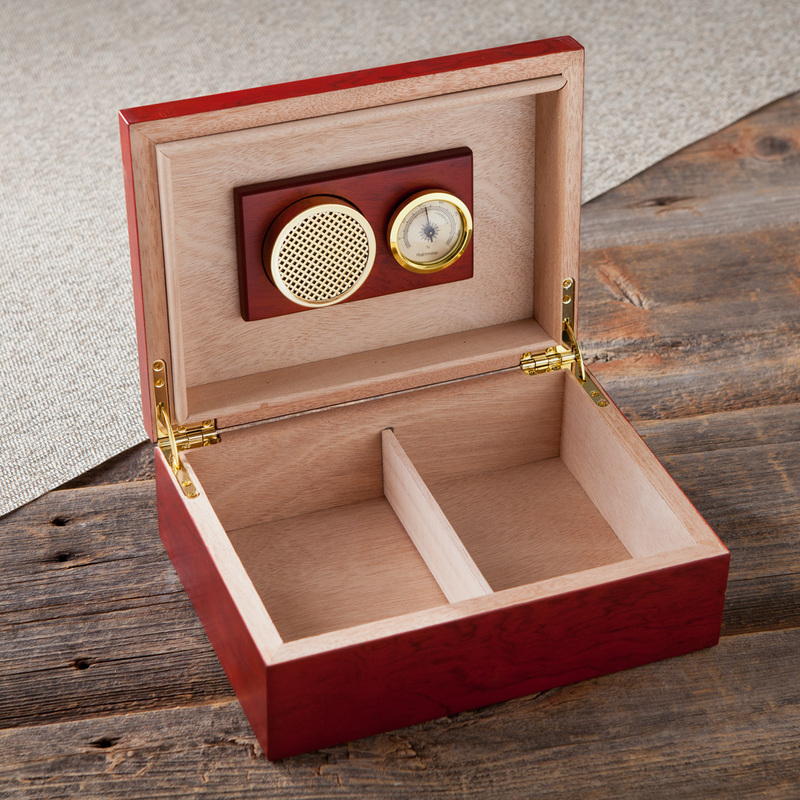 Features include two adjustable dividers, polished brass quadrant hinges, custom brass handles with lock and key, a single Spanish Cedar lift-out tray, the Diamond Crown humidification system, and a digital hygrometer. 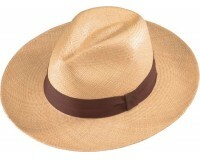 Capacity is 100 average size Cuban Cigar s, or 80 large Cuban Cigar s, 8-1/2" x 52 gauge. 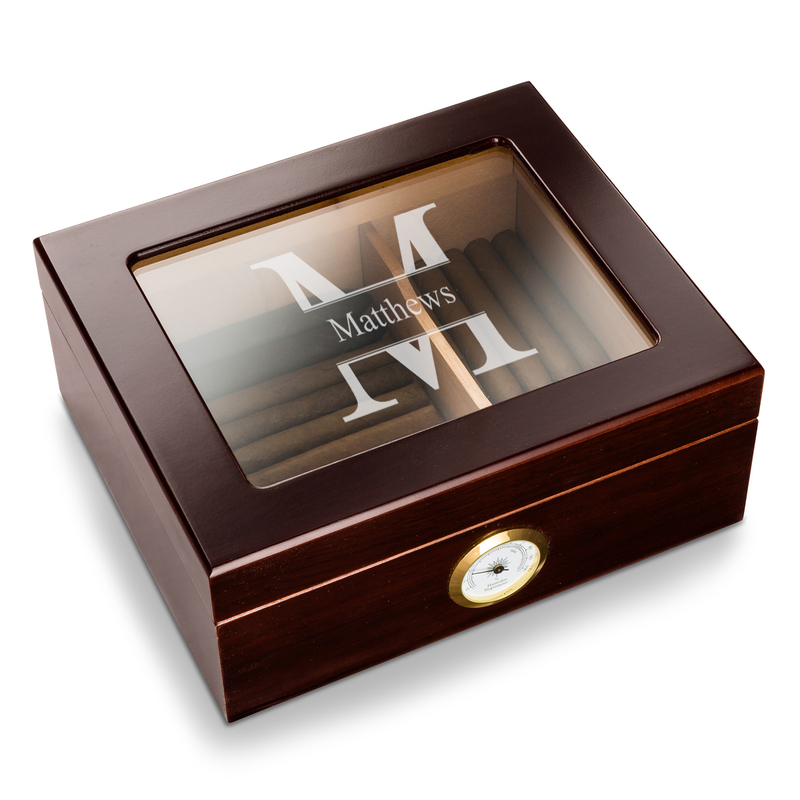 Interior Dimensions : 13-1/8" x 9-5/8" x 4-1/2"
Exterior Dimensions : 15-3/4" x 11-3/4" x 6"
An attractive Cherry finished, Spanish Cedar lined humidor with an elegant shaped design. 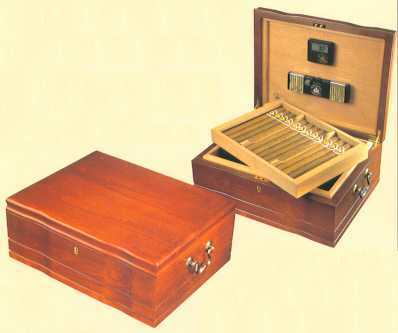 Includes two adjustable Spanish Cedar dividers, Diamond Crown humidification system, and will hold 50 large Cuban Cigar s.
Interior Dimensions: 12-1/8" x 7-1/8" x 2-5/8"
Exterior Dimensions : 14" x 9-3/8" x 4-1/2"